Elizabeth “Anne” Carter died unexpectedly on Sunday, Dec. 23, 2018, at Mass General Hospital with her loving family by her side holding her hands. She was born on New Year’s Day, Jan. 1, 1943, in Ballintubber, County Roscommon, in Ireland to Cissie Mahon Kelly and Brodie Kelly. Anne grew up in Ballintubber and attended Mount Sackville Private Convent School in Chapelizod, Ireland, and then the Sisters of Charity, Kings Inn St., Dublin. Her studies in bookkeeping were pursued at Caffreys College, followed by computer studies at Dorset College. In 1959, Anne started off as a trainee in an accounting position in a financial company, and later in 1961 worked as an accountant for Builders Supplies. Through the years she would work in various accounting positions, including working as a supervisor in a large manufacturing company while overseeing five clerks, and as office manager for Wholesale Importers in Dublin City. She and her husband Liam owned and operated a retail store for five years before they emigrated in 1988 to the United States. They found their home, joining their sons Adrian and Damian on Martha’s Vineyard. There she would hold the position of assistant town treasurer for 28 years before retiring in 2016. Anne continued to work for the Town of Tisbury in different departments up until her death. Anne was a woman of deep faith, volunteering at catechism school when her grandchildren attended, beaming with pride when her grandson Bryan made his First Communion. She was dedicated to her grandchildren, attending soccer and baseball games as well as school functions that had her doing everything from making Irish soda bread for a social studies class to a papier-mâché gorilla. Anne loved finding a good bargain and often shopped for unique finds at the Thrift Store, showing them off to friends and family, or going off-Island to shop with her colleagues. She loved attending the movies that were shown at the Vineyard Haven library and was also an active member of the Tisbury Senior Center. Anne’s life was dedicated to family and friends. Whenever there was a party or an event she would be there with a smile on her face, happy to be with her loved ones. Anne was beloved by all who knew her. She was a woman of style, grace, and compassion. 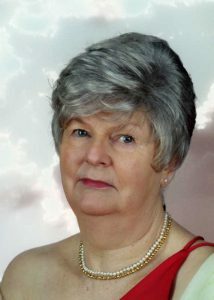 Anne is survived by her husband Liam, whom she met on June 6, 1962 at a ballroom dance on O’Connell Street. They dated for two years, marrying on Sept. 8, 1964. They were happily married for 54 years. She is survived by her loving sons, Adrian (Joan), Damian (Amanda) and her grandsons Bryan and Julian. Anne is also survived by her brothers, Jimmy (Carmel) Kelly, Brian Kelly, and Milo Kelly, her sister Marie Bermingham, as well as many nieces and nephews who will miss their Auntie Anne. We will all miss her tremendously. Visiting hours in the Chapman, Cole, and Gleason Funeral Home will be held on Friday, Jan. 4, from 9 to 10:30 am. Her funeral mass will follow and be celebrated in St. Augustine’s Church, Franklin Street in Vineyard Haven at 11 am. Burial will be in the Oak Grove Cemetery, State Road, Vineyard Haven. A reception will be held in the P.A. Club, Vineyard Ave., Oak Bluffs. Visit ccgfuneralhome.com for online guest book and information. Anne was about the only pleasant aspect of going in to the Town Hall to pay tax bills. You could always count on her to treat you with such kindness. Though I never looked forward to being there, I will certainly miss her good cheer about it all.